First up are the stores that are Iconic Syracuse. Next Thursday, we’ll tackle desserts and sweets. Follow the series here. Ever take someone to Wegmans that has never been there? Isn’t it fun to watch their eyes pop out of their sockets and roll through prepared foods and into the cheese department? My ninth-grade earth science teacher once told me a story about taking a teacher visiting from the former Soviet Union to a Wegmans in Liverpool while he visiting the country on an exchange project. Apparently the teacher cried. I wholly admit to taking Wegmans for granted. As stores open in different cities to clamoring crowds and people camping out overnight, I think of it as the grocery store around the corner from my house. I’m spoiled. I’m also okay with that. Drive by The New York State Fair on Bridge Street, go over the curved bridge, past where Carmen’s used to be, and over both sets of railroad tracks to where Bridge meets Milton Ave. Diagonally to your right is a century-old grocery turned meat market that has survived where big grocers have not. Ascioti’s was founded in 1914 by Antonio and Caterina Ascioti, who emigrated to America from Italy. Their children continue to operate the store; 92-year-old Philomena sits behind the register most days as the Time Warner TV guide plays music in the background. Ascioti’s is best known for its homemade meatball mix and sausage, but it is also a first-rate meat counter with cut-to-order steaks, homemade bacon, and braciole (ohhhhhh the braciole). An adjacent freezer case is loaded with Cora frozen pasta and Hapanowicz soups and sauces, while loaves of DiLauro’s bread line the top of the meat case. Leave your credit cards at home. It’s cash only, though they installed an ATM machine recently. Nichols Supermarket will celebrate its centennial in 2018. C.L. Nichols opened his store on First Street in Liverpool nearly 100 years ago before it was bought by Jim Hennigan in the late 1950s. It has since passed to Jim’s son, Mike, who is part-manager, part-stockboy, part-neighbor. Walk through the store on any given day, and there is the bespectacled manager facing a shelf, stocking items and expediting meat orders. Much of the time, he is talking to the shoppers, his neighbors, who are the lifeblood of this store. Nichols is one of a few grocers that still employs butchers, an art and craft lost to large supermarkets and centralization of these tasks. And it fills a huge gap at the holidays now that Peter’s (née Williams Grocery and Meat Market) and Sweetheart Market in North Syracuse closed. Nichols stepped up carry all of the traditional Italian fishes for Christmas Eve like smelt, eel, and salt cod. Dominick’s used to have this wonderfully old-school Lotto sign on the front of its building on the corner of Lodi and Gertrude Streets in Syracuse. Lights would alternate behind stenciled signs of all the New York Lottery games. I always thought that was the coolest thing as we would find ourselves stopped at the light adjacent to the store. 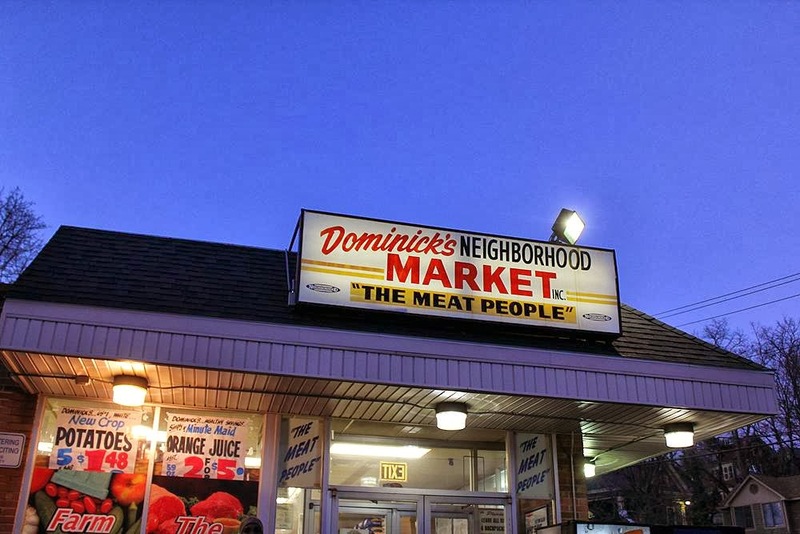 Dominick’s is a Northside institution, doing for the Northside and Hawley-Green neighborhoods what Nichols does for the village of Liverpool. The sausage and meatballs are made to this day using Dominick Battaglia’s mother’s recipe. Tell me that it wouldn’t have been easy for Paul Nojaim to up and move out of his near Westside location. Tell me it wouldn’t be easy to operate that store like a police state. Tell me it wouldn’t be easy to disengage from that neighborhood and just take its money. Of course it would. The 95-year-old grocery store thrives because it does none of that. It is an oasis in what would otherwise be a food desert. Paul Nojaim is not just a business owner but an activist and advocate for the community, working with government and non-profit organizations to support his efforts to improve the health of his customers through proper nutrition. He provides jobs and a pathway to college for kids in the neighborhood, and serves some of the poorest residents of this city. And his business does well, as evidenced by a $2.65 million renovation that was completed in October 2014. What I love about the Syracuse Real Food Co-Op is the fact that you never know what you are going to find when you walk in. Tucked on the border of Westcott Nation and the University, the Co-Op carries local produce, baked goods and meats, and was one of the first purveyors of organic foods in the community. And it’s all crammed into a 1,200-square foot space. It’s part health-food store, and part showcase of great local ingredients. Founded in 1972, the store has more than 2,700 members that each own part of the store. The Wife is my soulmate but prosciutto is my first love. As a child, I used to convince my parents to buy the Italian cured ham every so often. The only place they would dare purchase it was Lombardi’s on Butternut. About all that has changed since opening its doors in 1930 is dropping the fruit from its name and offerings. Do you like provolone? They have about 20 different varieties? Do you like prosciutto? There are about 4 or 5 choices in the case. Just be sure not to trip over the buckets of olives at the foot of the deli case while reaching for your order. Brothers Dominick and John man the deli counter, while the aisles overflow with imported pastas, tomatoes, oils and other Italian foods. I’m not sure what to say about Green Hills Farms that has not already been said. Tucked away in Syracuse’s Valley, it’s easy to forget that they are there. What began as a roadside stand in 1926 is now a full-line grocery store with an in-house butcher, fresh seafood and homegrown produce. Plus, it has a scratch bakery that makes its own donuts, which is somewhere between dangerous and illegal. Or at least it should be. These Northside institutions have been around since the Earth cooled (I’m exaggerating. A little. Columbus opened in the late 1890s; DiLauro’s a few years later in 1908.). Both are known for their crusty, golden Italian bread that adorns tables in homes and restaurants across Central New York. Everyone has their favorite (mine are the semolina and the sesame Sicilian twist from DiLauro’s) but no one can dispute their respective popularity. Saturday’s farmers market on Park Street originated during the Great Depression. In 1938, markets like this offered farmers to work directly with their customers. It moved to its current space on Park Street in 1942, where it has grown to more than 400 stalls. 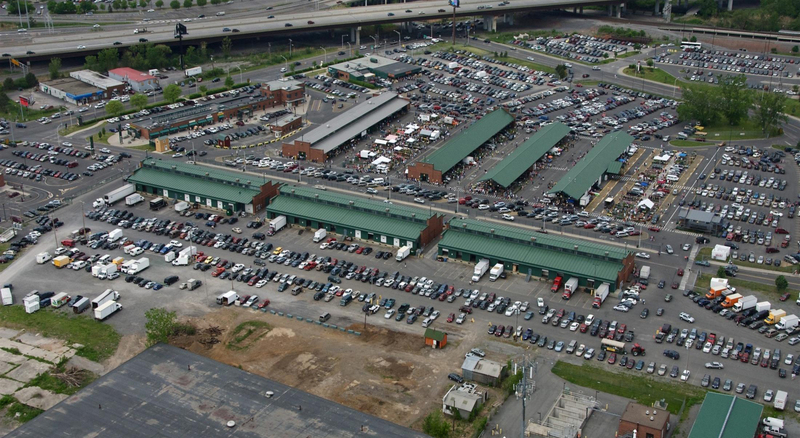 During the spring and summer, more than 25,000 people visit the market for fresh produce. Over the past 10 to 15 years, more and more specialty foodmakers like Flour City Pasta, gluten-free bakery Deborah’s Sweet Treats, Wake Robin Farm, and Good Nature Brewing Company have taken up space to market their product. It is a beautiful cultural intersection for this area, as Saturdays take on the demographic “melting pot” of ethnicities and socioeconomic backgrounds. It reminds you that when it comes to the simple things, like food, that we’re all the same. We’re all eaters. So, dear readers, what did I miss? Make your case in the comments. Featured image: The old William’s grocery store on Route 11 in North Syracuse. From SyracuseNostalgia.com. Hi, Jared – What a fun post! I don’t know if it’s an icon yet, but Side Hill Farmers Meats and Market SHOULD be an icon, IMO. Also, it’s fun to take a spin through Samir’s on E. Genesee Street and Smith Housewares and Restaurant Supply. Oh, you don’t get one argument from me about Side Hill Farmers and their quality. But, I’m not sure they have been around long enough to be iconic. You know what has that I missed? Liehs & Steigerwald’s. Great site! As a native Liverpudlian, I have to mention Galeville Grocery (now Byrne Dairy). The bell that still hangs was used to warn the salt workers that rain was coming. Welcome to the site. The name sounds familiar…I once played Little League with Todd Goodnough in Liverpool. I remember P&C and Midstate. I remember hearing about Acme and A&P locally. Beyond that, those names are foreign to me. Vince: Are you any relation to Carmen Morgillo who was a Northsider?